A. How do you help a group reach agreement? The ToP Focused Conversation is dedicated to helping a group develop a shared awareness on a topic. In Session 3, the focus was on the Focused Conversation method itself. In Session 4 we went deeper to understand how the components of the focused conversation can be combined to elicit deeper meaning. The first part of Consensus Workshop - Facilitating Agreement shares those insights. 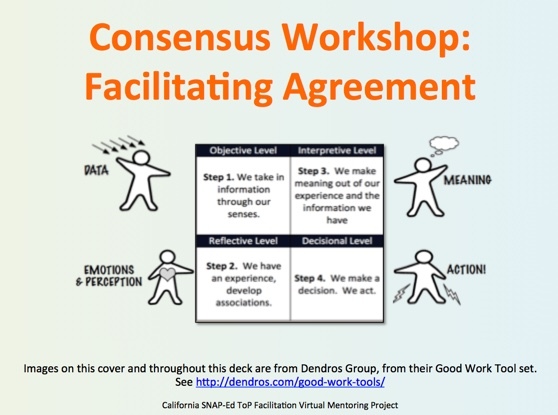 Consensus Workshop is a ToP method that uses the ORID sequence of the Focused Conversation in a specialized way in order to help a group reach consensus on a question. Highlights of the consensus workshop process - and the ORID components that comprise it - is the focus of the second part of Consensus Workshop - Facilitating Agreement. B. How do you prepare to facilitate a consensus workshop? The process is very structured with its five stages (Context, Brainstorm, Cluster, Name and Resolve). The instructions are very specific (and very important) in the ToP Facilitation Methods participant manual. Write them into your design and follow them until you know them by heart. A critical preparation is to be very clear about the basis for pairing similar ideas. 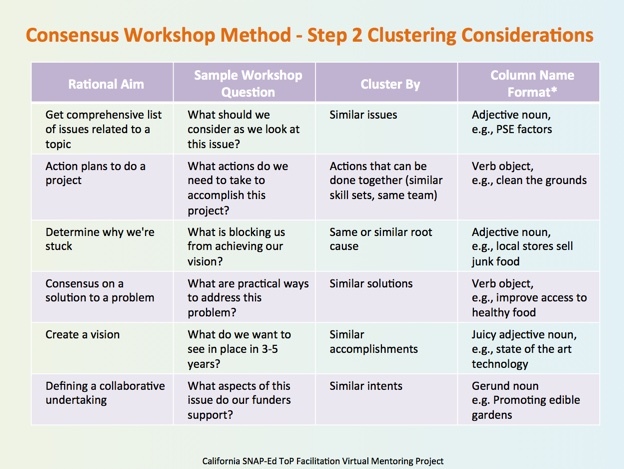 SNAP-Ed Consensus Workshop Clustering Considerations offers several variations for clustering, the focused question and naming formats. 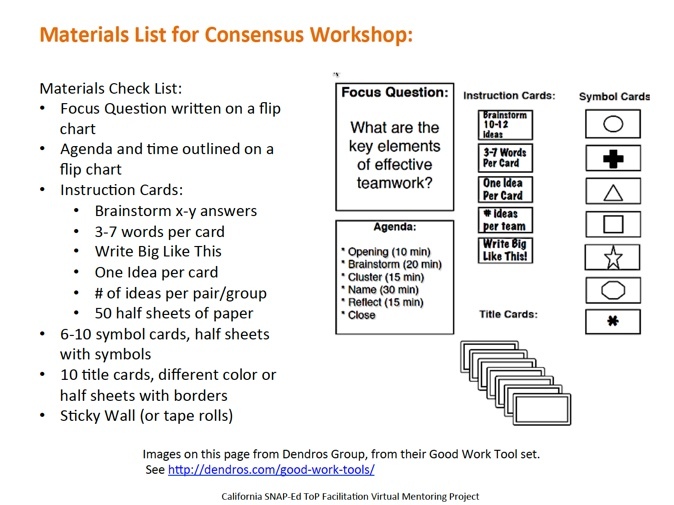 Use the materials list and visual prompt in the Materials List for Consensus Workshop. These helpful hints come from the Dendros Group, whose founders were part of the group first documenting ToP Methods. C. What do you do when time is short or the group is small? A consensus workshop can be powerful when there is only one participant, so the group can never be too small. When the issues involved are relatively simple and the group is small, an easel workshop is a great alternative. 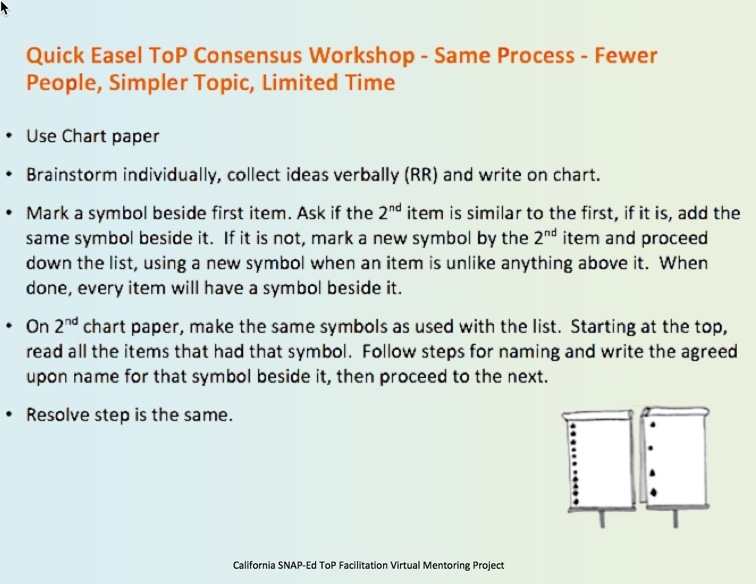 See the Quick Easel Consensus Workshop for instructions. D. How do you document the results of a consensus workshop? The consensus workshop results should be captured in a table with two rows - the top row holds the names created by the group and the second row holds all of the data. There should be as many columns as there are names, adjusting font size and column widths as necessary to hold the data on a single page. 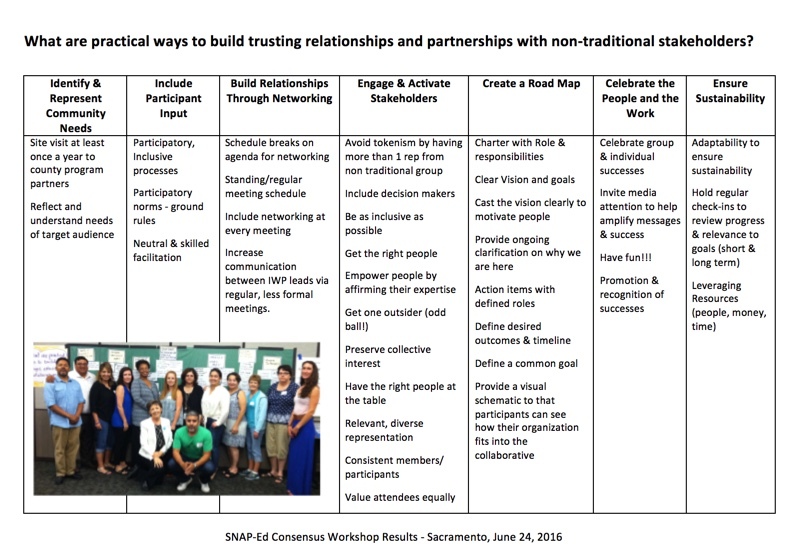 The results of a consensus workshop with a collection of SNAP-Ed leaders in response to the question "What are practical ways to build trusting relationships and partnerships with non-traditional stakeholders?" are offered as a documentation sample. Sample documentation for Consensus Workshop: "What are practical ways to build....."